Norway is aiming to make its short-haul flights 100% electric by 2040. This would make it the first country to switch to electric air travel. Journeys taking up to 1.5 hours - which includes all domestic Norwegian routes and those to neighbouring Scandinavian capitals - should be entirely electric, said Norwegian airport operator Avinor's chief executive, Dag Falk-Petersen. Avinor will make a tender offer for the first commercial electric air route in 2025, which will carry 19 passengers. Electric flights will cost half as much to operate and will only be half as loud as current jet engines, Falk-Petersen claimed. Until Norway’s air travel goes 100% electric, it will rely on hybrid engines and bio-fuels. Domestic air travel in Norway accounts for 2.4% of its greenhouse gas emissions. When international air travel is included, this figure doubles. "When we reach our goal, air travel will no longer be a problem for the climate - it will be a solution", said Falk-Petersen. The European Commission’s Flightpath 2050 Vision for Aviation calls for reduction of CO2 by 75%, reduction of nitrogen oxides by 90% and reduction of noise by 65%. Despite being the largest oil and gas producer in Western Europe, Norway is an electric transport pioneer. It has the highest rate of electric cars per capita in the world. 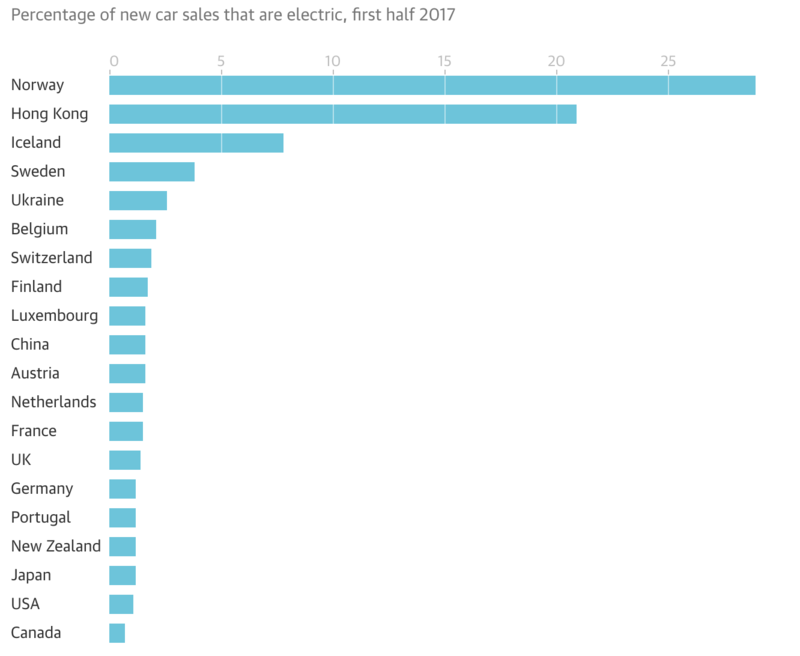 In 2017, half of new cars registered in Norway were electric or hybrid, according to Norway’s Road Traffic Information Council (OFV). A third were hybrid, while 18% were fully electric. From the 1990s, the Norwegian government has offered incentives to electric car buyers, including exemptions from road taxes, bus-lane access, free travel on toll roads and free parking. By 2025, the government intends to stop sales of combustion engine cars. Until now, battery technology has been the main obstacle to entirely electric air travel. Present storage capacities make the number of batteries needed prohibitively heavy. In 2016, aircraft manufacturer Airbus shelved work on its fully electric E-Fan aircraft. Instead, it is working on a hybrid fuel-electric model, in collaboration with Rolls-Royce and Siemens. The E-Fan X aircraft is expected to launch in 2020. But technology is improving. In November 2017, UK airliner Easyjet partnered with US firm Wright Electric, and said it could be offering fully electric short-haul flights within the next decade. Wright Electric is developing a 100% electric aircraft with a target range of 335 miles. Approximately a fifth of Easyjet’s passengers’ journeys fall within this range. Electric ambitions are taking to the skies.